Myanmar's overall health system performance is considered to be one of the poorest in the world. 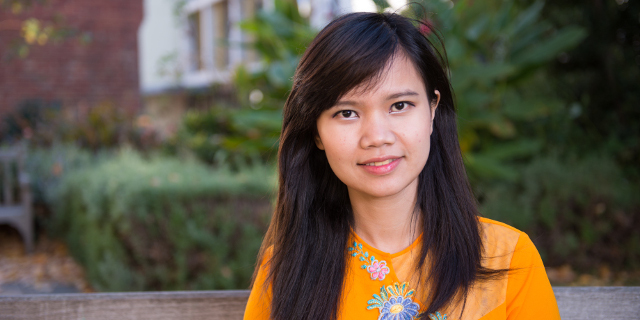 Australia Awards scholarship recipient Dr. Su Mon Latt studied her Master of Public Health in the hope that she can help to transform the community health services in her home country. The University of Melbourne is one of the best universities in Australia, especially when it comes to public health studies. It has a good reputation not only for it’s outstanding health science and research, but also for its variety of specialist streams. I also decided to choose the Melbourne School of Population and Global Health because of the diversity of students and staff at the university, the nurturing environment, and the comprehensive services for international students which enable us to perform at our best. One of the highlights of the Masters of Public Health at the University of Melbourne was meeting and getting to know public health professionals from diverse backgrounds and all corners of the world. This is so different from where I come from. In my country, Myanmar, most of those who study public health come from a medical background like myself. At the University of Melbourne, students come from very different backgrounds, medical, nursing, engineering, mathematics, science, economics, teaching and you name it! There were around 200 of us in our cohort and every one of us had amazing and inspiring stories to share. I have three major goals to be accomplished in the next two-year period. Firstly, I will take a job back in my country to apply the knowledge and skills that I have learnt during my Masters of Public Health so that I can help improve the community health services in my country. Secondly, I would like to share what I have learnt with my friends, and other public health fellows. Thirdly, during these two years I will improve my skills through my work in preparation for a ph.D. I was motivated and inspired by the academic staff and professors who all had outstanding research studies. One day I would like to be one of them. Honestly, going back home. I feel motivated when I go back to my home country with a sense that I have become a better and a more useful person who can give something back to my community. Don’t wait for good opportunities to come to you. Instead, start seeking them. Start TODAY, Start NOW. What would be the most difficult decision you have ever made? One of the most difficult decisions in my life was choosing to become a public health professional rather than a medical doctor. I made a right decision and I never went back. What do you most love about your career? What I love most is being able to have a positive health impact on thousands of people. What drew you to your area of expertise and what do you love about it? My area of expertise is epidemiology. Since I was in medical school I have had a curious mind for differences: why this disease happens to this patient and not to that patient with a similar history? Epidemiology was a good fit to me since we can actually use various study designs to discover the cause and effect of different diseases, or investigate social inequities. What is the greatest accomplishment of your life so far? The greatest accomplishment of my life so far is achieving the prestigious Australia Awards Scholarship to study at the University of Melbourne. The Australia Awards Scholarship totally changed my life and played a significant role in who I have become. What helps you persevere when you feel like giving up? Whenever I feel like giving up, say on my studies when I am abroad, I always think of two types of people. Firstly, I will think of those less fortunate than me, who cannot study or gain formal education even if they wanted to. So, why should I give up when I have this opportunity that so many would love to have? Secondly, I think of those who have already been in my position and successfully accomplished the same task. So, if another human being could do it, I can make it happen too.